Vibration has been used for therapeutic purposes since the late 1800s. Presently, vibration therapy is used by NASA to help prevent muscle loss in astronauts, and it is becomingly more widely available to the general public and people that are interested in physical therapy Denver. 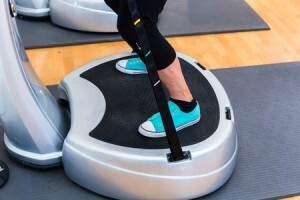 The benefits of whole body vibration therapy are obtained by lying, sitting or standing on a machine that is supported by a vibrating platform. With vibration machines, frequency and amplitude are adjusted to meet the specific needs of each patient. During whole body vibration therapy, vibrations generated by the platform are transferred to the body and provide a number of benefits. Research has shown that vibrational therapy has benefits for people suffering from Parkinson’s disease, multiple sclerosis and a number of other conditions. It is also beneficial for individuals who are unable to exercise regularly. Is Whole Body Vibration Therapy Safe? Whole body vibrational therapy is generally considered to be safe when performed by qualified professionals, but it isn’t right for everyone. Vibration therapy could be dangerous if the vibration intensity is too high and could cause back pain and lumbar injuries. You are taking medications to thin your blood. At Denver Physical Medicine & Rehab, we are proud to offer whole body vibration therapy in Denver. To learn more about this treatment and find out whether it is right for you or if you want to find out our other physical therapy services, contact us today to schedule a free initial consultation. Call 303-757-7280 today for additional information.